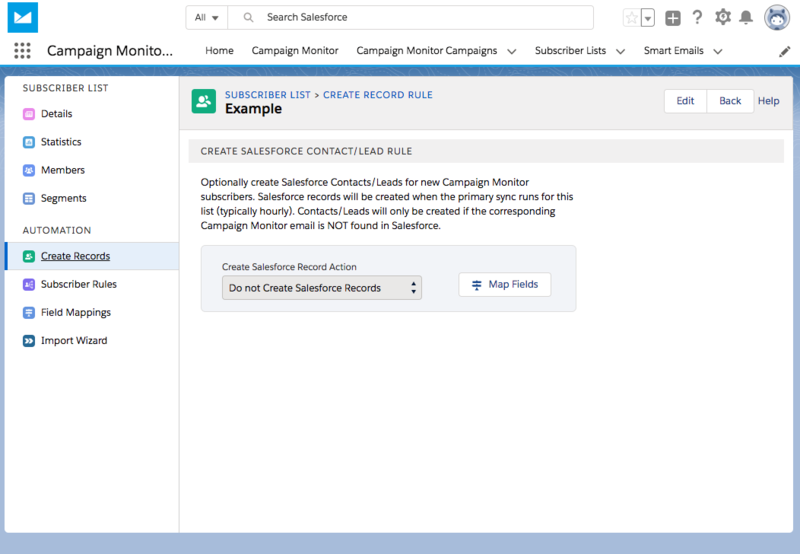 When you connect Salesforce to Campaign Monitor, synced Campaign Monitor subscriber list members are matched with your contacts and leads by email address. Those contacts and leads are then updated accordingly. By default, contacts or leads aren't created using Campaign Monitor data. You can change this behaviour for each subscriber list, so if a matching contact or lead isn't found when syncing, we will attempt to create it. In Salesforce, go to the subscriber list tab. Select the subscriber list you want to work with by click the list name. Select Create Records from the vertical navigation. Click on the Create Salesforce Record Action dropdown and choose to create contacts or leads. Ensure all Salesforce required fields are either mapped or have default values otherwise records may not be created. Changes only apply to new subscribers. If you would like to retrospectively create new Salesforce records from existing subscribers, Reset Stored Data for "Subscriber list members".